New Winter 2018: Baking cookies is making memories for youngsters and great grandma too. 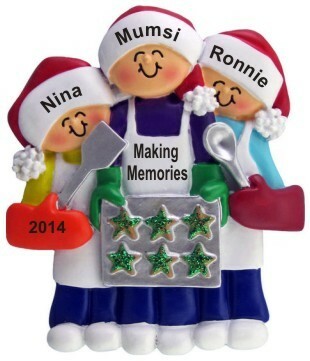 The fun of those special moments is captured in festive detail in the baking cookies with great grandma 2 children personalized Christmas ornament from Russell Rhodes that arrives in our plush and pretty velvet gift pouch. When you provide us with the custom details, an artist will letter them on by hand in a pretty font to create a grandparents ornament enjoyed by all the generations. Select an instant family favorite this year, the great grandmother two kids baking ornament Christmas ornament in cheerful holiday colors from the Santa caps to the glittering treats on the tray.